Q: What is a chicken run? A chicken run is the fenced or enclosed outdoor space you provide for your chickens. 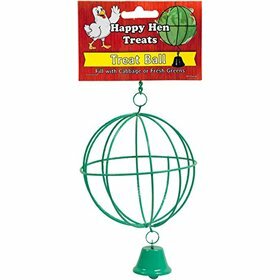 The coop is the indoor space---where they go to sleep on their roost and lay eggs in their nests---and the run is the outdoor space, where they may sun bathe or dust bathe, forage in garss and scratch in the dirt. 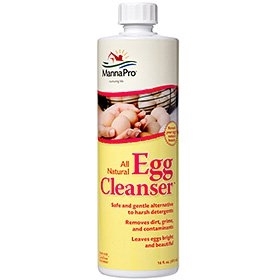 In general, you want to provide your chickens a MINIMUM of about 10 square feet per bird of space overall, split between the coop and the run. The more space the better! Since chickens prefer to spend most of their time outdoors foraging in the yard, make your run as large as you can. Keep in mind that while chickens don't generally fly for long distances, most breeds can at least fly high enough to clear regular 4 foot fences, and some bantam breeds can fly up to the tippy-top of trees! That's why it's popular in town to have a small run fully enclosed with welded wire hardware cloth (chicken wire is actually too weak to exclude predators) attached to the coop. 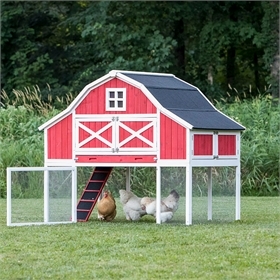 A small, attached keeps the chickens enclosed and safe... but also allows them to be let out into the larger yard when their owners are around to supervise and make sure they don't wander too far, jump fences, or squeeze through them. Coops with small, attached runs are usually not meant for full-time confinement, because they may not provide enough space, which increases your flock's stress level. The exception to this would be "tractor-style" mobile coops. The mobile coops are moved to fresh pasture every day or every few days, and so they maintain a grassy run that is entertaining to the flock. Chickens in permanently sited coops with small attached runs will quickly eat the grass down to dust. With nothing to forage on, they're more likely to pick on one another. 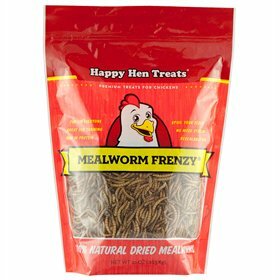 For those reasons, be sure to provide your birds with plenty of space, outdoors and in. 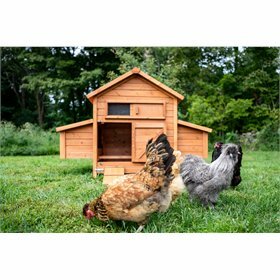 What is a chicken coop? What is a droppings tray? 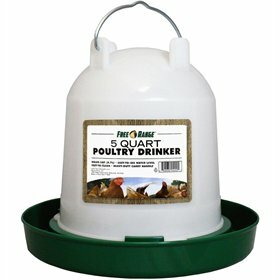 What is a feeder for my pet chickens? What is an apron fence, and why is it helpful? What is wire gauge, and why should I care about it?